Happy January! I wanted to make you aware of some new Baltic Amber jewelry we will be offering this year. As usual, at Spark of Amber, shipping is free in the United States. These products are expected to be available by the end of January! First, we are offering a new Baltic Amber raw bracelet for adults. This bracelet is called the “Twilight Raw Amber” bracelet, and is inspired by the colors of a sunset. Really beautiful, and perfect for lovers of raw amber! 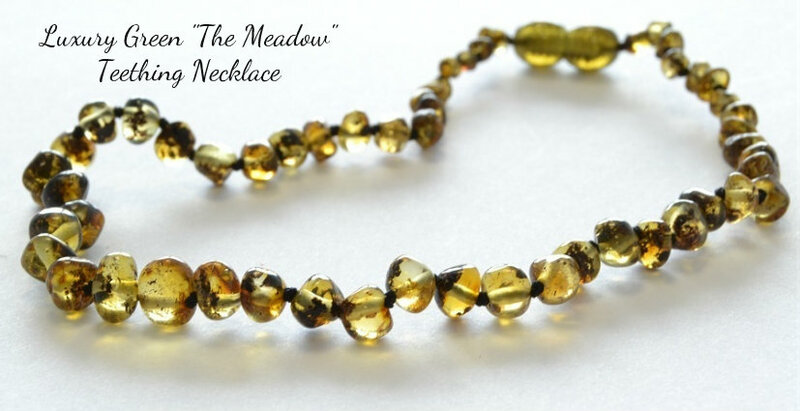 Next, we are offering a Luxury Meadow Green round beaded Baltic Amber Teething Necklace. This is part of our luxury line of teething necklaces. We already offer a buttery white amber luxury teething necklace. 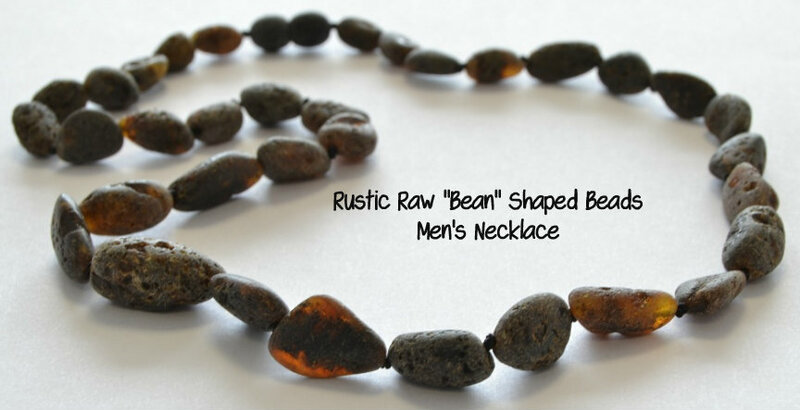 Spark of Amber is adding a new Bean-Shaped rustic raw necklace with men in mind! This will be a longer length of approximately 20-21 inches long. We are also adding a new cascading necklace for women in our luxury amber collection. 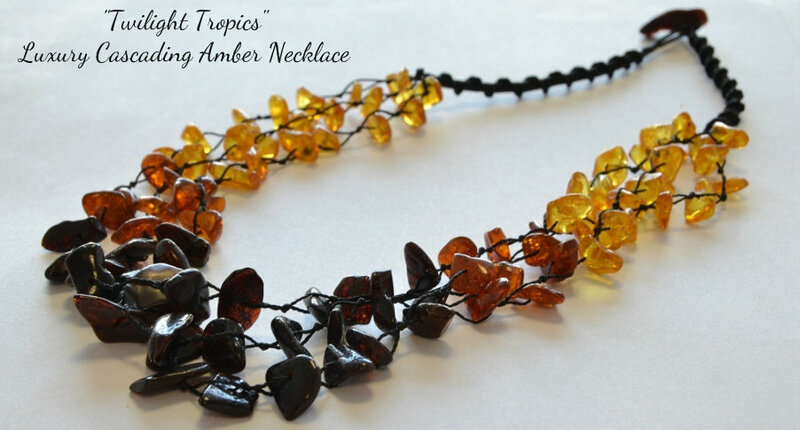 This amber necklace is the “Twilight Tropics” cascading Baltic Amber necklace, inspired by the colors of a tropical evening. It is really beautiful, and trendy! Great for every day, the office, or a night out! 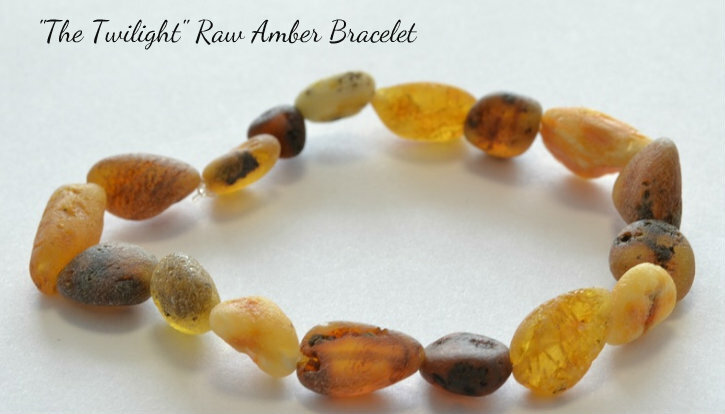 And, at Spark of Amber, we are also offering a new Rainbow Raw stretch amber bracelet for adults, to match our Rainbow Raw Baltic Amber necklace! Join us on Facebook to see when these items are available for purchase. Also, we are adding some other favorites. Our Serenity youth size necklace will be restocked, and we will soon be adding an “It’s a girl” Luxury Teething necklace (combining raw amber and rose quartz) to our collection. In the later spring, we plan to add “It’s a boy” (combining raw amber and turquoise). These will make wonderful gifts. Visit our website often so you do not miss out! This entry was posted in Baltic Amber Gifts, Baltic Amber Jewelry, Baltic Amber Teething, SparkofAmber News and tagged Amber, amber bracelet, Amber jewelry, baltic amber, Baltic Amber bracelet, baltic amber necklace, baltic amber necklaces, green amber teething, Green Baltic Amber, luxury baltic amber, men's amber necklace, new baltic amber jewelry, New Baltic Amber products, spark of amber. Bookmark the permalink. 1 Response to New Products Available Soon from Spark of Amber! Hey, Nice collection of designs. Thank you or sharing.